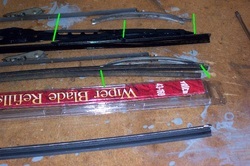 This is more specific to the wiper blades themselves. 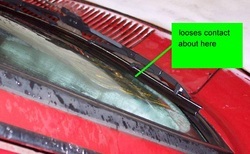 This info is geared for someone who has never replaced their wiper blades before, so for most of you, it will be very basic. I was having problems with the aftermarket blades that came with the car. They were lifting up a bit at 70mph and chattering on the window because the rubber wouldn't "flob" when it switched directions. I lucked out and got another stock set with one of the other 510 wgns I bought. 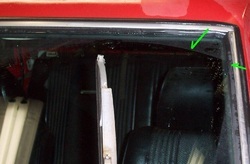 You can see how the blade was not even making contact with the window where it curves on the passenger side. 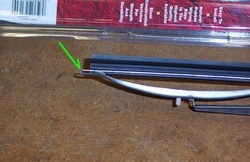 To get this style of platic blade off, use a small screwdriver and gently pry on the tab at the arrow. 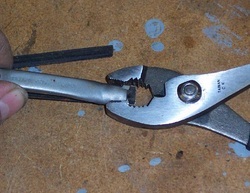 It will lift slightly releasing the short dowel(nub) inside the hole. Once the tab is lifted, pull the blade off the end of the arm. Here’s the difference between the two blades. You can see the extra contact point at the left green line. This is keeping the rest of it from bending around the curve of the glass. 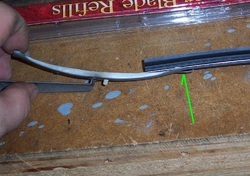 To get the stock blades off, you pull on the little tab (A), then slide the blade off the end of the arm. If you can see the other tab (B), they are on backwards. 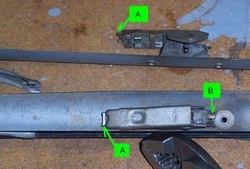 If they are on correctly, you can lift the arm up far enough and move the blade enough to get at the (B) tab. You push down on it to release it. The second way is the easier of the two. If you use the second method, this is what you will see. 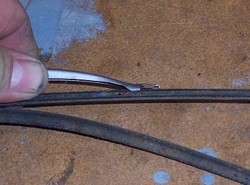 Pushing down on the tab (B) pulls the fingers (C) back far enough to release the pin (D). The original refills were very flat on the top. 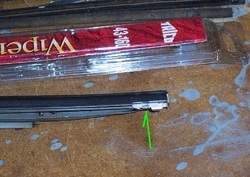 The new style is a lot thicker and you’ll probably need to put a slight bend in the end of the wiper assy. As you can see, you’ll have a hard time feeding it to the next set of tabs if you don’t. Feed the refill through each set of tabs. You should not be able to squeeze the refill at the tabs enough to make it come out. If you can, squeeze the tabs a bit closer together to prevent this, but not so tight that the refill won’t slide in them. It’s almost all the way in. You can better see the bend in the wiper. You might be able to squeeze the end tabs of the refill with your fingers, but I prefer pliers. 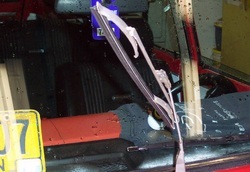 You want the arrow like ends to lock behind the tabs on the wiper. This is also how you would remove this style. With the refill in all the way, the other end will look like this. It should be close to the end when the blade is straight, but not touching or past it. 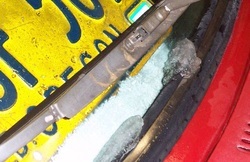 You also want to flex the blade to make sure that the refill isn’t so short that it comes out of the wiper tabs. Much better match to the windshield now. I’m not very bright, so I tend to double check my work. Here’s a bit of evidence to prove my point! Even after I put it back on the second time, I hadn’t noticed that the airfoil was backwards. I released it with tab (B) and turned it around. You can see where the old blade cleared and that the new one is a bit shorter. I’m short, so I don’t miss the 1” of cleared window. The shorter blades don’t smack my rubber molding. 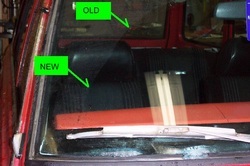 On the passenger side, you can see the difference, but it’s in a spot that won’t matter one bit. 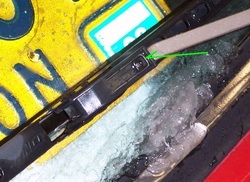 The stock wipers have a lot more “wiggle” in them which allows the blade itself to flop when it changes directions. 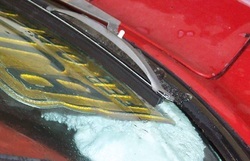 The plastic ones would push the blade without the flop which caused it to “chatter” on the window. Right after this picture, I applied the RainX! There was some talk about the arms not pushing down on the window hard enough. 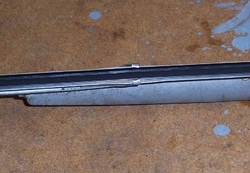 The top arm is collapsed and the bottom one is extended. You can see the stretch in the spring. 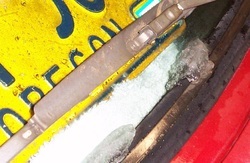 With it collapsed, you can use a pair of pliers and unhook the “C” tab. This allows you to replace the spring, change the length, or just clean out the spider’s nest. 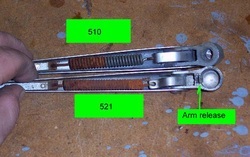 The 510 arm uses a special type of nut to hold the arm on. The 521 is held on with the little tab that the arrow points to. You can see that the springs are almost exactly the same length, but the “C” tab is different. You could possible use the 521 tab on the 510 and get a lot more down force. To get more force on the 521 arms, you’d probably have to get a different spring or shorten it like Datsunaholic stated earlier. 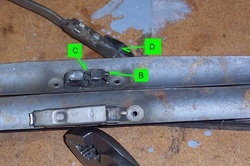 You could actually fabricate another “C” tab, but if you don’t make it out of stainless steel, you’ll have a rust problem.